VALUE PACK FOR WOMEN Is your skin reflecting your age, stress or neglect? 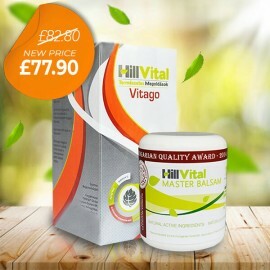 HillVital skincare ..
Honey soap and anti-wrinkle cream offers a brilliant combination full of energy. This pack offers gentle natural care without any harm. The result is a healthy, glowing skin. Value Package for damaged meniscus Meniscus pain and swelling can be reduced and eliminated. Pr.. Gentle but intense natural treatment of a damaged meniscus. 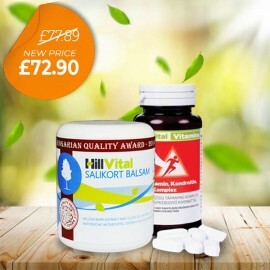 Unique complex skin care with anti-inflammatory Salikort balm and high-quality joint nutrition. Value Pack for Gout Treatment Don't let Gout destroy your day and depress you with endless pa..
Value pack for gout and associated pains. 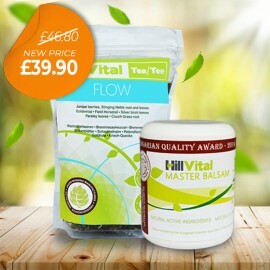 Master Balsam offers help from the outside while our herbal tea Flow offers help from within. 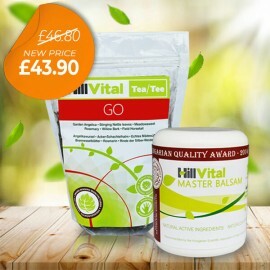 Intensify your fight against gout with our effective pack! Pack for Psoriasis For Psoriasis Relief Our pack for treating psoriasis offers gentleness ..
Value pack for psoriasis combines gentleness and power in a unique duo of vitamin complex Vitasoft and balsam Psorisoft. This is not an accident but an intense treatment combo in the fight against psoriasis. Soaps with activated charcoal - Value Pack Do you have acne-prone skin? We have prepared a valu..
Natural therapy for acne. Problematic skin suffering from acne or rashes requires natural and safe treatment. Our black soaps charged with activated charcoal can be a breakthrough in your needs and expectations. VALUE PACK STOP ACNE HillVital products represent a solution to your problem with acne and ..
STOP acne value pack contains essential vitamins that stimulate the skin from within and soap that soothes and heals the skin on the outside. Our pick "Value pack STOP acne" offers a synthesis of trust, quality and effect. Value Package STOP Cramps Introducing HillVital value package for cramps containing Varikoflex ..
3 high-quality products for cramps! Natural herbal extracts nourish and regenerate hair. Carefully picked ingredients. STOP ECZEMA PACK Are you getting tired of trying to treat your eczematous skin? 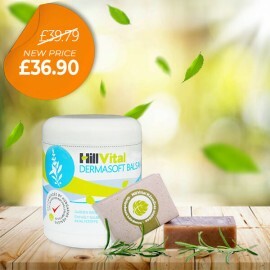 We know your sk..
Value pack for eczema. Are you tired of your skin care? We know your skin is dry, flaky, itchy and irritated. Try our unique combination of coal tar soap and healing Dermasoft balsam. VALUE PACK STOP PSORIASIS Psoriasis does not only affect the skin but also the mental state of ..
Our pack consists of natural products that help, relieve psoriasis symptoms and help prevent corticoid and steroid treatment. 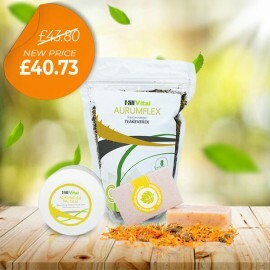 Incredible combination of natual herbs helps relieve itching and provides comfort for irritated skin. STOP SKIN DISEASES Are you suffering from eczema, dermatitis, rashes or rosacea? Is your skin d.. 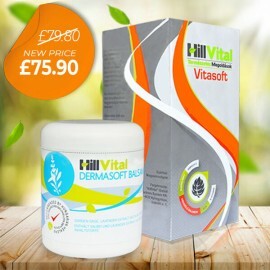 Combination of Dermasoft and Vitasoft perfectly understands the causes and consequences of skin diseases and treats them accordingly. Our products help stabilize dry, sensitive, harsh and itchy skin and supports it with hydration and intense nourishment. 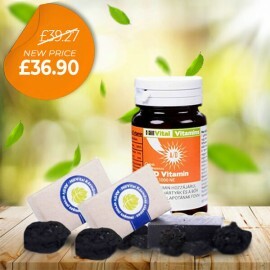 The Athlete’s Foot bundle helps Treat Foot mycosis - fungal feet, Stifle itching, H..
Value pack for Haemorrhoids For Haemorrhoids Relief Our value pack offers help from within.. Combination of our natural balsam, herbal tea blend and marigold soap helps bring desired relief from haemorrhoids. Turn to nature for help! 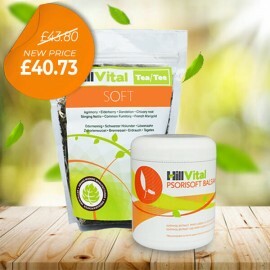 Balsam and soap tackle problems from outside while our tea blend provides support from within. 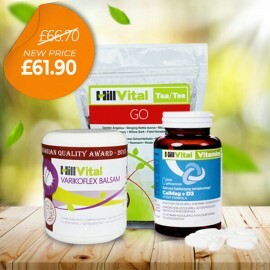 Value Pack KOMPLET GO for pain Are you experiencing knee or back pain, stiffness or damaged car..
For achy joints. Value pack offers pain-free, non-invasive and safe skin care for joints, bones and the musculoskeletal system. Introducing a simple solution with powerful effect. Take a step forward with Komplet GO. VALUE PACK STOP PAIN BACK Healthy joints and pain-free movement are among the biggest wishes..
Value pack for joints and back is ideal for those that encounter pain when conducting ordinary activities. Is conventional treatment not helping you? Unique value pack STOP pain contains best-selling Master Balsam and herbal tea blend Tea GO. 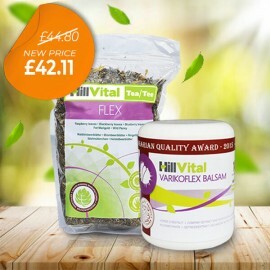 VALUE PACK FOR VARICOSE VEINS Natural Balsam Varikoflex: Contains 13 potent herbs that h.. Unique pack for varicose veins, swelling, leg pain associated with veins and ‘heavy’ legs. Unique mixture of healing herbs relieves inflammation, pain, swelling and strengthens venous walls.